First of all, I'm high and dry, as are all of my family and friends here in Washington. Thank you to all those who have contacted me with concerns and questions. Here's some pictures of the flooded Interstate and valley below my folks' farm (and the home where I grew up). 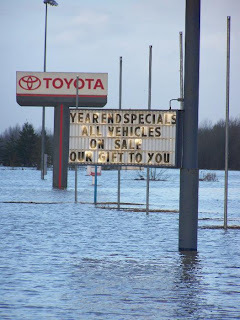 Fortunately water didn't reach them either. I know I've blogged several times about my Mom's wonderful garden, it would have been sad to see that washed out as so many people's land has been... It's almost surreal to realize this is all just a few miles down down the (now inaccessible) freeway from us. 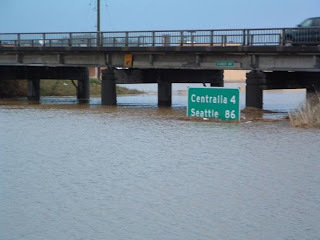 So, yeah, if you've been watching the news, you may have seen the dramatic pictures of all the flood devastation here in Washington State, specifically Lewis County and towns like Rochester, Chehalis and Centralia. At first, I was surprised how much coverage the floods were getting on National News even. I guess I didn't realize how extreme things were at first, since we got comparatively little rainfall here at our place. Anyway, not to worry, thanks for your concerns, I live further north, far out of the flood zone. My parents, on the other hand, live smack in the middle of the county and flood waters, but fortunately they live high on a hill, safe and dry. ( <-- <-- See the hill in the distance beyond the "airport" picture? That's 'their' hill). Granted, their "hill" is an island for the time being, surrounded by a valley that's turned into a river, but they've lived there 40+ years and been through this many a time before. The Coast Guard offered to helicopter them if they need to go anywhere, but they are actually in great shape, they have clean well water, electricity and enough food for an army. My Dad called and said there are actually some back roads that he can get to town on with his 4 wheel drive truck, and being a physician, they've needed his services the last few days. The photos I included were taken by family and friends of my parents, people who live in the immediate area. Hope all of you are warm, safe and dry. wow, i had no idea how severe it was. i'm so glad you and yours are okay!! Oh wow! I didn't realize this was going on. Those photos are shocking! I'm so glad your family and their property is ok. I didn't realize this was going on. that so bad. im glad all your family is ok.
Wow. That stuff is so scary. I'm glad to hear you and your family are safe. My heart goes out to all of those less fortunate. We're a bit west of there... had no power for 4 days, and the roads were mostly closed due to trees, power lines, poles, etc. I'm glad to hear that you and your family are safe and my heart goes out to all those affected. wow, those photos are mind-blowing. I'm glad you and your family are safe and dry. That's crazy awful! i'm so glad your folks are high and dry, but my God, the people whose homes are gone...I really feel for them. I know what I would be going through if this were me. I'll be thinking about them. I didn't know about these floods and I am really sorry to hear about this! Glad to hear that you and your family are safe. I know how it feels to live in a flooded town and I hope that things will get back to normal soon. I'm glad that you and your family are okay but I'm sure you know people affected by the flooding so it's still hard. Just know that we're all thinking about you! Hi, Just checking in to make sure all is well and you are above water. Missing you!